Front row seating for the Esala Perahera in Kandy, Sri Lanka one of the most colorful festivals in Asia. Day 5: Hatthikucchi Vihara. Nillakgama Bodhigaraya. Day 7: Dambulla. ‘The Gathering’ at Minneriya. Day 9: Nalanda Gedige. Aluvihara. Esala Perahera Festival. Day 11: Gadaladeniya Vihara. Lankathilaka Viharaya. Embekke Devale. Seetha Amman Temple. Day 12: Dowa Raja Maha Temple. Buduruwagala Temple. Day 13: Mulkirigala. Dondra Devalaya. Dondra Lighthouse. Star Fort. Day 15: Drive to Colombo. Free time. What is the Esala Perahera Festival? There is a legend that when Buddha was cremated, one of his devotees found one of his teeth in the ashes. Sometime later this sacred trophy was smuggled to Sri Lanka where it has been housed in Kandy’s Temple of the Tooth Relic for centuries. The Esala Perahera Festival is a celebration of Sri Lankan Buddhism where this holy relic is paraded through the streets, along with almost 100 richly decorated elephants (many with neon lights flashing) accompanied by a cacophony of percussionists pounding traditional drums, dancers clanging finger cymbals and the rhythmic thumping of mock sword battles, creating what may be the most dazzling religious extravaganzas in Asia. 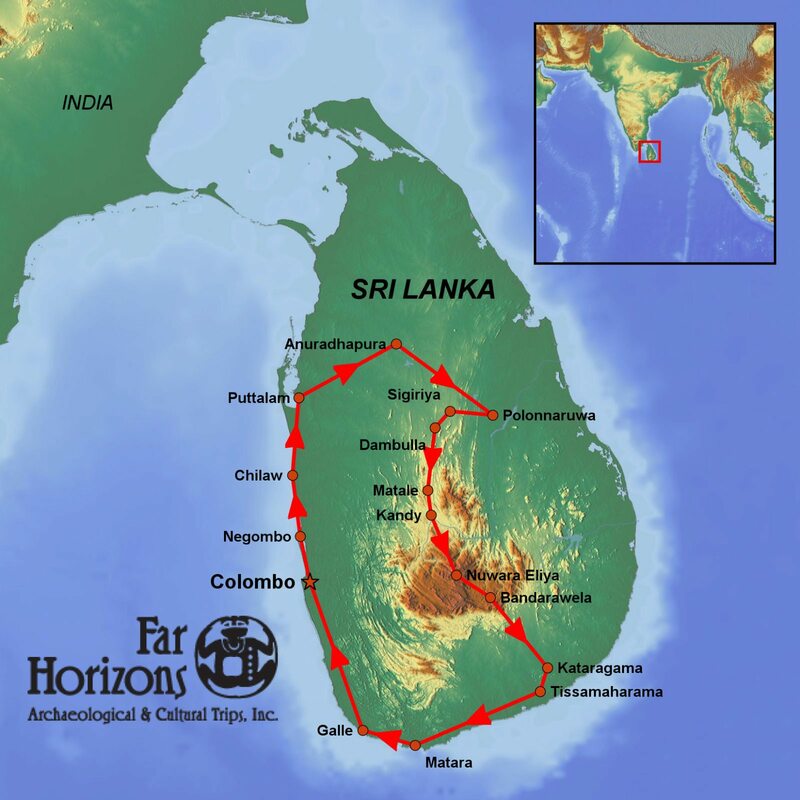 Sri Lanka’s fascinating history spans at least three thousand years. Known as Lanka, the ‘resplendent land’ in the great Indian epic Ramayana written around 500 BC, over the centuries many others have testified to the island’s natural beauty. Deep water harbors provided strategic importance and through the ages many great civilizations developed here. Today’s Sri Lanka is the home to a fascinating abundance of languages, religions and cultures. Almost straddling the equator, Sri Lanka’s weather is determined by it’s two monsoons – one from the north-east and the other from the south-west. In July and August there is a gap in the rains which makes this an excellent time to visit the country! Join Far Horizons and only 13 others for an 18-day tour of this enticing land, including six of the island’s UNESCO World Heritage Sites! Anne M. Blackburn is a Professor of South Asia Studies and Buddhist Studies in the Department of Asian Studies at Cornell University, and Director of the Cornell University South Asia Program. She taught at the University of South Carolina before joining Cornell’s faculty. She received her BA from Swarthmore College, and MA and PhD degrees from the University of Chicago. Dr. Blackburn studies Buddhism in South and Southeast Asia, with a special interest in Buddhist monastic culture and Buddhist participation in networks linking Sri Lanka and mainland Southeast Asia before and during colonial presence in the region. Day 2: Arrive into Sri Lanka, transfer to the Jetwing Beach Hotel in Negombo and overnight for one night. Day 7: Enjoy the day at the medieval capital of Polonnaruwa. Designated a UNESCO World Heritage Site, this is the second most ancient of Sri Lanka’s kingdoms and was declared the first city of the land in the 11th century by Vijayabahu I, the king who united the country. Today, the monumental ruins of this fabulous garden-city testify to the discipline and creativity of the kingdom’s first rulers. Built on the shores of a large artificial lake and within a rectangle of fortification walls, the site includes a profusion of palaces and sanctuaries. Day 18: Arrive in the USA. Single Supplement: $1,295.00. Should a roommate be requested and one not be available, the single supplement will be charged. Cost includes: hotels, meals as outlined, ground transportation, services of an English-speaking guide, entry fees, and gratuities. Cost Does Not Include: International airfare; a separate donation as outlined below; passport or visa fees; airport or departure taxes; food, alcoholic beverages and other drinks not on the regular menu; excess baggage charges; laundry, telephone, fax or email charges, and other items of a personal nature. A deposit of $750.00 and the separate donation check for $150.00 (made out to the designated project) are required along with your registration form. Final payment is due 120 days before departure. Upon receipt of your deposit and completed registration form, you will be sent a reading list and a tour bulletin containing travel information. Prior to the trip, we will send links to various websites of pertinent interest to the trip. Click here to download our Registration Form. Cancellations received in writing at least 120 days before departure will result in an administrative fee of $450.00. Cancellations received less than 120 days prior to departure will not receive a refund. If for any reason you are unable to complete the tour, we will not reimburse any fees. The purchase of travel insurance with both trip cancellation and emergency evacuation coverage is strongly recommended. If Far Horizons must change the trip dates or cancel the trip, Far Horizons is not responsible for any air ticket you may have purchased. The private tours of archaeological sites and museums, and talks by specialists are scheduled in advance and include a donation to each. Specialists working at these sites are excited about showing their work to interested enthusiasts. However, there may be times when the director or a staff member may not be onsite when our groups arrive due to other commitments, or that the date or time of our visit to their project must be changed. This trip is for the hardy! The itinerary has been designed to be as comfortable as possible, but Sri Lanka is a developing country. Our bus is well maintained, but may not be new and there may be some long days with travel over unpaved or partially paved roads. Climbs of hundreds of stairs may be required to reach some areas, including walks over steep gradients and over poorly maintained paths. The adventurous nature of the itinerary makes it essential that participants be in good physical condition and have the ability to maintain a flexible attitude.All travelers must be able to walk and climb independently as there will be no one to assist with this at sites. All hotels have been chosen carefully for their charm and location. Please note that not all properties have a pool. Although wifi is available at each hotel, it sometimes may only be accessed in public areas and not in rooms. Team spirit and a sense of humor will be helpful!